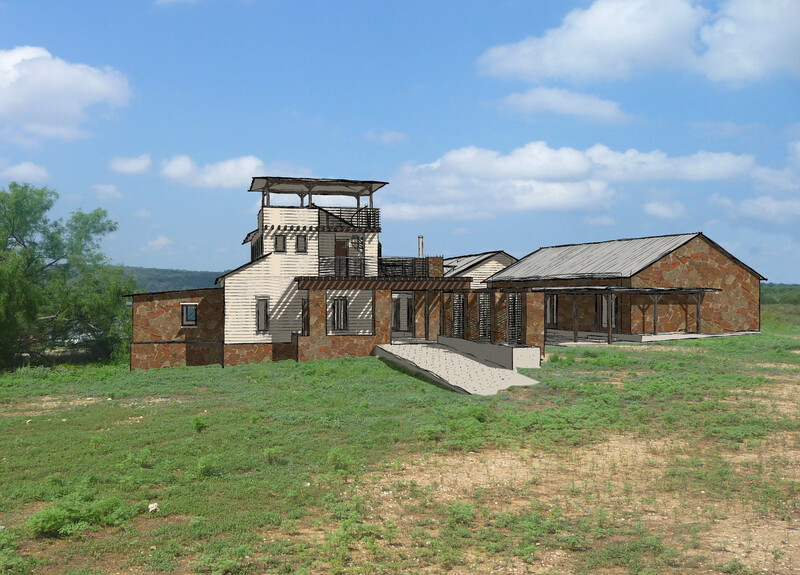 DESCRIPTION: The client’s picturesque hill country site included a 1,000 sq. ft. homestead cabin built in the 1940’s located between two spring fed tanks (ponds). Upon discovering a time capsule hidden in the wall of the cabin the owner determined they really wanted to rehabilitate the cabin and incorporate it into the new residence. This desire along with their love of entertaining and hosting guests for long weekend visits became the focus for the concept. The plan joins three separate “cabins” with breezeways and porches organized around a central courtyard with a fire and bbq pit. The original renovated cabin shall house guest quarters, with an adjacent cabin housing the residents master suite, and the kitchen and living spaces framing the opposite side of the courtyard. The owner’s desire for a “lookout” reminiscent of the needs of early Texas settlers is also incorporated to further take-in the surrounding views.